Transmission Source: NASA's Dawn spacecraft on its final approach to the giant asteroid Vesta, situated between Mars and Jupiter. Date of orbital insertion: Friday, July 15, 2011. Mission status: Orbital insertion confirmed. On July 15, history was made when NASA's Dawn spacecraft became the first probe to enter into a prolonged orbit around a celestial body in the asteroid belt. With telemetry and deep space communication provided by NASA's Deep Space Network, Dawn closed in on Vesta, a 330-mile wide asteroid, after four years and 1.7 billion miles of travel. This mission has huge significance for humankind, but also a particular significance to my job and internship with the Deep Space Network's Antenna Mechanical and Structural Analysis group because it is responsible for the vital design and engineering components that make communication with the Dawn spacecraft possible. Recently, I had the chance to visit the Goldstone, Calif., Deep Space Network Tracking facility (check out my photo album on Facebook! ), one of the three sites around the world that houses the network's massive antennas. And just when I thought my mind could not absorb and process any more surreal advanced technological wizardry and human determination, NASA, JPL and the Deep Space Network again exposed me to new horizons. To provide you with a brief 101 of the Deep Space Network, or DSN: It is the largest and most sensitive scientific international telecommunications system in the world, charged with interplanetary spacecraft missions and radio and radar astronomy observations for the exploration of the solar system and the universe. How's that for a job title! In other words, it is responsible for communicating with and guiding spacecraft, probes and NASA missions sent into space, (including the rovers on Mars, whose driving team will be featured in a special guest interview for my next post). The DSN monitors asteroids and celestial objects and their proximity to Earth, searches for signals and anomalies from outer space, performs interferometry observations, measures variations in radio waves for science experiments and provides the vital two-way communication link that guides, controls, and brings back images and science data from planetary explorers. There are three large deep-space communications facilities strategically placed approximately 120 degrees apart around the world: at Goldstone, in California's Mojave Desert; near Madrid, Spain; and near Canberra, Australia. This strategic placement permits constant observation of spacecraft as the Earth rotates and has been in constant operation monitoring the night skies with the first antenna being constructed in the '60s. The roots for what would eventually become the DSN began in 1958 with the establishment of an antenna and tracking system to receive telemetry and plot the orbit of NASA's Explorer 1, the first successful U.S. satellite. Shortly after, NASA established the concept of the DSN as a separately managed and operated communications facility that would accommodate all deep space missions, thereby avoiding the need for each flight project to acquire and operate its own specialized space communications network. The component of the DSN that I'm working with, Antenna Mechanical and Structural Analysis, is a phenomenal team that provides ground support and engineering, and builds, designs, and fabricates the antennas and components that make up these massive spacecraft-tracking facilities. In particular, my task this summer is to design, model, and fabricate the future addition of a platform to hold the cryogenic equipment and processing hardware on a brand new, 34-meter beam-waveguide antenna being built in Australia! Even cooler - literally -- is the fact that the incoming signals from the Mars rovers and interplanetary spacecraft are funneled down these giant antennas through a network of mirrors, then cooled to cryogenic states where molecules can actually be separated and extracted from the "noise" of other space signals, processed in a maze of computers and analyzed for whomever or whatever that signal is for or from. I must admit that gathering the seismic, vibration dampening tolerances and heat exchange data for the build requirements was a little nerve-racking, yet also so exciting! Basically, I was charged with gathering data such as Australia seismic codes, dampening and vibration tolerances for the feed cone, material strength and human "live-load" factors of safety, all of which are used in international engineering projects. Luckily, my group members are an amazing and highly encouraging team who help me out tremendously and guide me with precision and experienced accuracy. 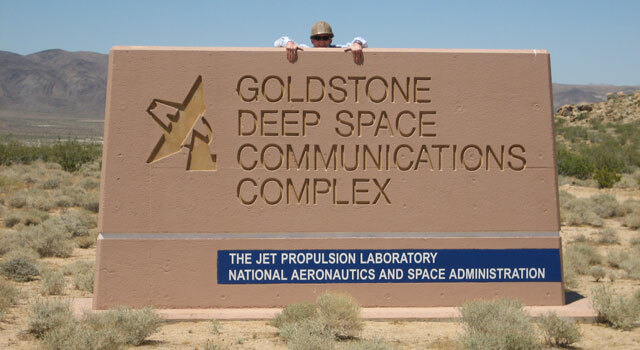 To help gain a better perspective on and appreciation for the magnitude and caliber of the Deep Space Network's responsibilities, we took a trip to one of the three DSN tracking facilities: Goldstone, Calif. And boy did it give me goose-bumps -- in a good way! After several military checkpoints, security screenings and identity checks, we soon arrived at what can only be described as something straight out of "Star Wars" or some other sci-fi movie, a site fittingly called "Mars," with antennas that seem as big as my hometown pointed at the sky. My jaw dropped, my mentor Jason laughed, and we stepped out of the car to look straight up at what looked like part of the Death Star aimed into outer space. 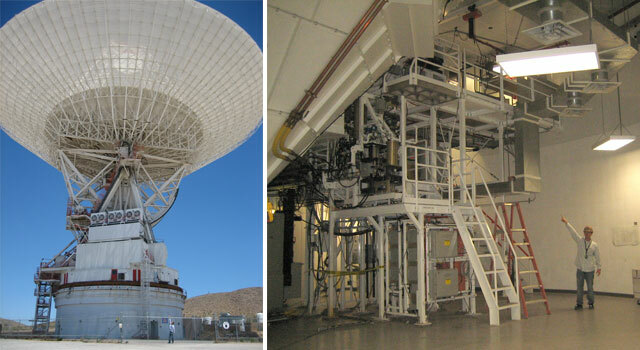 This particular antenna at the Goldstone site is among the biggest and most sensitive of all of the DSN antennas, spanning 70 meters (230 feet) across and capable of tracking a spacecraft traveling more than 10 billion miles from Earth. The precision across the antenna surface is maintained within one centimeter (0.4 inch) of the signal wavelength, an amazing feat that reminds me what an incredible opportunity it is to be working with this team. The day consisted of exploring and analyzing all the systems and subsystems that comprise the massive array of tracking antennas. All the while, I couldn't help but think how cool it was that as Earth rotated, these can be programed to switch control to an antenna on the other side of the world in order to maintain constant contact with all the spacecraft and signals out there. One highlight was walking down one of the antenna tunnels that led underground to the inside of the massive concrete pedestal that houses the huge 34-meter antenna above as well as the space-age cryogenic processing equipment and platforms that hold them. The signals are essentially funneled down the antenna structure and dish by a matrix of precisely aligned mirrors. 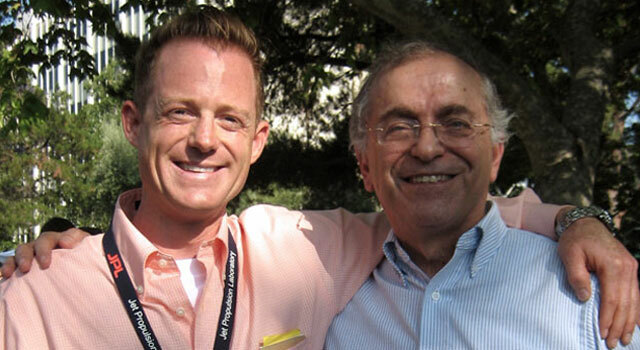 They are then captured and funneled into a network called "wave guides." Radio waves coming from deep space and other sources, like spacecraft, are guided along this tubing, which gets smaller and smaller passing though filters that eventually lead to a certain bandwidth ready for a trip to cryogenic-ville. All of this takes place in preparation for a result that to me seems like black magic but is definitely the coolest thing I've heard about: molecular separation for extracting the desired signals from the rest of the "space noise." As I contemplated the complexity and wonderment of how many people and years it must have taken to design and build all of this, an alarm and voice came on over the loudspeaker announcing that the antenna would be moving and tracking in two minutes, which was our cue to exit the premises. And it could only mean one thing: The antenna was adjusting to track some distant spacecraft or asteroid in the stars above, and once again, I couldn't help but smile and pinch myself at how amazing the universe and humankind can be. Stay tuned for my next post on how the Deep Space Network and the Antenna Mechanical group contribute to navigating spacecraft and rovers 15 million miles away, when I interview the Mars rover driving team!